My goal for last week was to have both my wholesale orders completed by today. 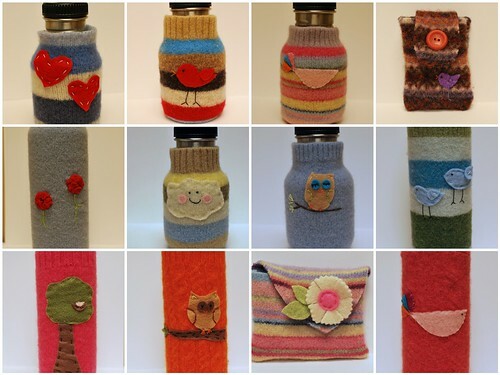 I finished my last Klean Kanteen cozy last night. So I accomplished my goal. Yippee. Now I have an owl to finish and one more wholesale order to finish. I have already started the owl and I think the other wholesale order will go faster. I am already thinking about Christmas so hopefully I will find a little bit of time to make some goodies for my shop. I am trying to be more organized with my photos. Goodwill had their half price sale on Saturday so I also racked up on sweaters. 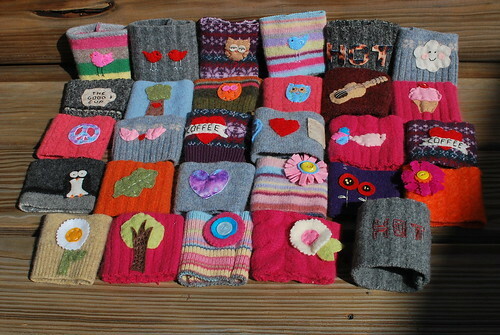 Here's a glimpse of some of my new sweaters. I keep on meaning to go to Goodwill to pick up some stuff to repurpose, but have yet to find time to run over there. If it isn't in my town I have a hard time running around trying to get to other areas. The canteen holders look cool! I would have never thought to make something for one of those. Great idea. Nice selection of new sweaters to work with! LOVE them. Love the ALL. But of course I am particular to the birdies! And the stripes and birdies! Eeee...even cuter! I just realized that J. put some sweaters in the Goodwill pile - I'm going to go fish them out and figure out what to use them for! Do you just felt them in the dryer?? GoodNESS you are prolific - and you do this on top of being a wife and mother and working fulltime. wow.